One of our Facebook friends tipped us off that there was a brouhaha over Bruce Makowsky’s QVC Today’s Special Value last weekend, which was an animal print haircalf and leather hobo purse at more than $200. On one of QVC’s forums, posters were disgusted and angry that Bruce was hawking a bag made of animal fur. Some women agreed with her: They were turned off and disgusted by the cow skin. Apparently, some shoppers were threatening to boycott QVC and were making rather accusations. Some posters claimed that QVC had taken down or censored their angry remarks. The hubbub over thie haircalf was “hilarious,” wrote one woman. After all, do the women who were protesting wear leather shoes and handbags? Hello, that leather came from a cow, girlfriends. We agree with the QVC watcher her posted this. “I watched all the hoopla yesterday on the boards and read many of the posts. I didn’t notice the ‘censorship’ because I started reading them later in the day and supposedly many had been reinstated. What I don’t understand is that this type of leather is just the reverse of regular leather, or at least leather that hasn’t had the hair removed. I don’t get where the belief that baby animals – or in one post aborted baby animals – had been used to make these bags. Calfhair is the term used to describe the leather, but that doesn’t necessarily mean that the leather came from baby cows. But there were many indignant folks who disagreed. Here is one of them. “I just can’t wear fur, of any kind, it just creeps me out. So that is why I didn’t get this one. And what lit my torch yesterday was QVC’s censorship of posts. I was up at around 2:30 am and there were several posts about how many of us just didn’t like the idea of real fur. They were not fanatical.. just.. ewww… I don’t like this one. Comments about ick factors. Later that morning those posts had all been poofed. That really got me angry. If they were going to pull those, then why not pull every negative comment on every product.. why just this one. I am also from a management world raised with the philosophy that you listen to your customers comments, and you make adjustments. The fact that QVC was censoring us and not ‘adjusting’ really got me going. Then the PETA folks came out full force later in the morning/day. Obviously there was such a backlash that QVC ended up pulling the TSV or making it look like it had sold out. Well folks, we have to side with QVC, at least in terms of the bag, not any censorship of its forums. As several posters noted, TJ Maxx is selling a ton of calfhair handbags, and we bought one there. We also purchased one fronm ShopNBC from its America West Collection. Haircalf is not a fad. It has been used to make purses in the Southwest and West for years. We don’t wear real fur coats, but we are not grossed out by cow hair purses. We actually think they are gorgeous, and love the texture and richness of them. We were tempted to buy Bruce’s TSV in leopard, but have heard so many negative things about the quality of his purses that we passed. It had nothing to do with the haircalf. So shoot us. But don’t be wearing leather shoes when you do it, hypocrites. We have long coveted Loree Rodkin’s edgy, and expensive, silver jewelry. 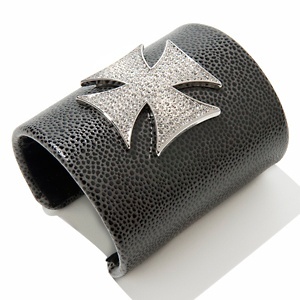 She often incorporates crosses in her rock-style pieces, which a number of celebs wear. We once saw a great pair of eyeglass frames in Montclair, and when we went into the shop to ask about them, we found out they were from Loree. And they were $700! So imagine our delight when we got HSN’s October Jewelry Guide, which had a rocking cross cuff and an unusual pendant and matching earring. Turns out it’s a new jewelry line, Love & Rock, by Rodkin. The Maltese Cross Crystal-Accented Cuff Bracelet has black stingray-design simulated leather or a turquoise-colored simulated leather. It is $70, and already has two rave reviews on HSN.com. We look forward to seeing Rodkin when she debuts on HSN Oct. 18. HSN has approved a plan to return capital to the company’s shareholders, including a share repurchase program for 10 million shares and a regular quarterly cash dividend of $0.125 per share. These are the first share repurchase and cash dividend programs initiated by the company, it said in a press release Wednesday. Under the terms of the share repurchase program, HSN will repurchase its common stock from time to time through privately negotiated or open market transactions, including pursuant to a trading plan in accordance with Rule 10b5-1 and Rule 10b-18 under the Securities Exchange Act of 1934, as amended, or by any combination of such methods. The timing of any repurchases and actual number of shares repurchased will depend on a variety of factors, including the stock price, corporate and regulatory requirements, restrictions under the company’s debt obligations and other market and economic conditions. The repurchase program may be suspended or discontinued by HSN at any time. The cash dividend will be funded from current cash and from present and expected future cash flows. The dividend will be paid quarterly with the first payment to occur on November 16, 2011 to HSN’s record holders as of Nov. 2. KNOXVILLE, TENN, Sept. 26, 2011- Jewelry Television (JTV) announced that veteran home shopping celebrity Judy Crowell has joined JTV as a guest host. Crowell, who worked as on-air host at QVC for 15 years and also enjoyed stints at HSN and ShopNBC, will begin appearing on JTV on Sept. 29 to represent JTV’s proprietary Stratify and Blooming Jewels Collections. Exclusively produced for JTV, Stratify is a collection of stylish jewelry offering the same look, feel and allure of yellow, white or rose gold without the associated high prices. The name Stratify signifies that each piece is layered in precious 18 karat gold over .925 sterling silver. 18 karat gold, which is 75% pure gold, is one of the most desirable gold karatages to own. Crowell will also represent Blooming Jewels, a dazzling collection of flower design jewelry featuring an array of colored gemstones. The same 18 karat gold over .925 sterling silver applies to this collection with showcases colored gemstones including rhodolite garnet, peridot, pink tourmaline, sky blue topaz, African amethyst, and citrine. “As gold prices continue to soar, we pledge to bring jewelry enthusiasts the jewelry they love at affordable prices,” said Pat Bryant, Chief Marketing Officer at JTV. “We’re thrilled to have Judy Crowell on board to represent Stratify and Blooming Jewels. She understands jewelry trends and the home shopping industry as well as anyone in the country,” he said. “When I saw the beauty and affordability of Stratify and Blooming Jewels I knew I wanted to be involved,” said Crowell. “JTV is the most exciting place to shop for the latest designs in jewelry and gems and both collections are top of the line,” she said. Jewelry Television (JTV) is the only broadcast shopping network that focuses exclusively on the sale of fine jewelry and gemstones. The privately-held company was founded in 1993 and broadcasts high definition programming 24 hours a day, 7 days a week, to over 80 million unique households in the U.S. Jewelry Television was recently ranked the 14th largest retailer of fine jewelry in the U.S. by National Jeweler. JTV.com is the fourth largest jewelry destination on the internet according to Internet Retailer’s Top 500 Guide for 2009. For more information, visit JTV.com. 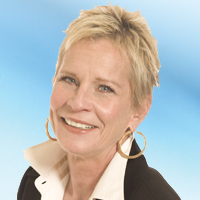 Judy Crowell, former host of QVC and HSN, is an expert in gemstones, silver, gold, fashion, beauty and fitness with more than 25 years experience in the television shopping industry. A Fashion Trend Forecaster, Crowell has traveled extensively to worldwide trade shows and witnessed first-hand the gemstone mining operations in Brazil, Bolivia, Australia, China, Nevada and Arizona. For more information, visit http://www.judycrowell.com. Here’s a heads-up for you “Jerseylicious” fans: Olivia Blois Sharpe will be appearing on ShopNBC next month. Shape will be on ShopNBC during its “Day of Beauty” on Saturday, Oct. 8. She will talk about the new NYX Cosmetics “Jerseylicious” palette (Haute Jersey Leopard Couture) and demonstrate her makeup tips. Sharpe will also be dishing about the “Jerseylicious” season finale (Oct. 16 at 8 p.m. on Style Network) and two-part reunion special (Part One airs Oct. 23 at 7 p.m., Part Two airs Oct. 30 at 7 p.m.
“Jerseylicious” airs Sundays at 8 p.m. on Style. 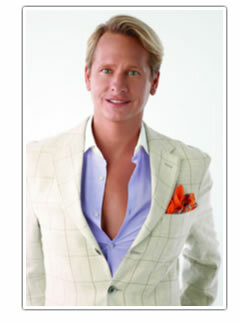 This just in: The odd couple of Brooks Brothers and Carson Kressley are on their way to ShopNBC. The No. 3 home shopping network will debut merchandise from the the retailer of upscale preppy clothes in November. ShopNBC will be hawking Brooks Brothers women’s accessories, handbags and scarves. And that’s not the only high-end company in the shoot. In the fourth quarter, the home shopping network will premiere another upscale line, Hartmann luggage. Kressley, of Bravo “Queer Eye For The Straight Guy” fame, had a brief stint as a QVC vendor, with a women’s apparel line. The 24-hour HSN event will take place Oct. 12 across all of HSN’s platforms, including on TV, HSN.com and HSN mobile. The Paramount Pictures release, directed by Craig Brewer and starring Kenny Wormald, Julianne Hough, Andie MacDowell and Dennis Quaid, will open nationwide Oct. 14. Inspired by the movie, HSN is going to be featuring fall collections of high-end contemporary footwear, fashions, accessories and beauty including the HSN debut of Zodiac USA and Keds. The event will also feature exclusive denim from Levi’s Curve ID and footwear from DKNYC, Libby Edelman and La Victorie. Designers Matt Bernson Special Project, Vince Camuto, Steven by Steve Madden and Twiggy LONDON will also have exclusive styles including their own version of the film’s iconic red cowboy boots. We don’t remember red cowboy boots in the original film. Was Kevin Bacon wearing them? HSN will also offer Footloose movie branded merchandise including apparel seen in the film, exclusive posters, and the film soundtrack featuring artists Blake Shelton, Big & Rich, Cee Lo Green, David Banner, Whitney Duncan, Lissie and Zac Brown of Zac Brown Band. As additional support to the Oct. 12 event on HSN platforms, the multichannel retailer has also developed a custom Footloose movie themed magazine with the editors of Footwear News, cross channel cable spots, and print advertising in Lucky magazine. HSN will also sponsor the movie premiere in Los Angeles Oct. 3. Tune in for the HSN event “Footloose” Oct. 12. Special features, videos, community boards and cast biographies, can be found at HSN.com/footloose. Sassy former ShopNBC host Charla Rines, who was unceremoniously dumped by the home shopping network, is now working with another refugee from the Minnesota, Jim Skelton. Rines, who is now in Florida, advised fans of her new gig on Facebook. She’s doing a show, “World of Watches,” with Skelton that airs on Dish Network, Charlie Ergen’s fiefdom, and DirecTV. hi folks, again & again i ask forgiveness for not being on facebook regularly. i’m having a ball on worldofwatches.tv. lior is amazing. now on air with skelton. kick me! he’s funny & knows his stuff too! love miami. it’s cooled down a bit (thank goodness). met some incredible people here. my daughter is working & going to school. love that kid. mr. cheeks is enjoying having madison’s two cats @ the house (kidding). what else to say? join us on direct & dish sat/sun 6-9pm. the deals are fab! Rock icon and reality TV star and philanthropist Bret Michaels is the latest musical artist to come to HSN to sell his wares. Michaels, in partnership with Dean Guitars, will launch his “Signature Acoustic Guitar Collection” and the exclusive HSN guitar bundle on Oct. 2 at 8 p.m. The exclusive acoustic guitar package includes a choice of either a black Player guitar or a pink Jorja Raine guitar and an 8 x 10 lithograph signed photo of Michaels, a ichaels guitar strap, a set of three ret Michaels guitar picks and a ‘Learn to Play’ DVD with over 400 minutes of practice sessions from TrueFire for $299.95. A two-disk vocalizer CD including a collection of vocal warm-up exercises for aspiring singers as well as Bret’s CD, “Custom Built” will also be available for sale. During the primetime special event, Michaels will also play a six-song set in front of a live studio audience at HSN headquarters in St. Petersburg, Fla.
We just heard back from roving home shopping host Judy Crowell, who has gone from QVC to HSN to ShopNBC to, now, Jewelry Television. Crowell had been doing a clothing line on ShopNBC, where her husband Paul Deasy is a jewelry vendor. Crowell just celebrated her 13th anniversary with Deasy, who is an alum of QVC and HSN. You are currently browsing the Homeshoppingista's Blog By Linda Moss blog archives for September, 2011.